I guess the question shouldn’t really be how the X-Men can move on from the events of Ultimatum, but who’s really left to pick up the pieces. 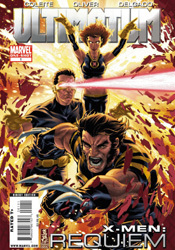 The path to Magneto’s final defeat took a hefty toll, and following the deaths of Wolverine, Cyclops and Professor X, (two of whom appear in action on the cover of this issue!) there’s a noticeable vacancy at the top of the team’s ranks. Who’s ready to stand up and take the reins of leadership for all of mutant-kind? How can they hope to overcome the black mark Magneto’s actions have left on the public perception of their race? I guess this farewell one-shot would be the first step. Assuming, that is, that your first step on the road to recovery is to have a three-on-three fistfight with the leftover bad guys, which is just about all that really happens in Requiem. As the last writer to deal with the series, Aron Coleite is tasked with sending it off into the history books. Strangely, though I’d imagine the thinking was to use a writer familiar with the characters to ensure a proper sendoff, from all indications this is Coleite’s first time playing around with the team. With the obvious exception of their mutant abilities, he provides nothing to distinguish one face from the next, and it doesn’t take long before they forego even that small shred of individuality to concentrate on simply throwing angry haymakers at the enemy and shouting. Coleite can’t even manage to do that right. Where did Mystique and Sabretooth go? One minute they’re in the midst of a brawl, the next it’s time for quiet reflection on the surface of a mass grave with no sign of them. Did the good guys just throw them on top of the pile? Where did Captain America come from? I’m looking high and low for the answers, but they aren’t here. Ben Oliver’s artwork pairs with Edgar Delgado’s colors to produce some breathtaking work in this issue, although their collaboration is frequently too vivid for its own good. Oh sure, when they come together and hit the mark, the stylized realism of Oliver’s linework teams with the added dimension and texture of Delgado’s colors to produce something genuinely fantastic. Their pin-up style portraits of Mystique midway through this issue and Sabretooth a few pages later are truly breathtaking, poster material if I’ve ever seen it. That doesn’t make it suitable for the subtleties and implied motion of regular panel work. Many times I found myself lost, confused by the sheer number of competing hues on a single page. It’s an information overload, more description than you’d want or need in a single moment, and it single-handedly slows the pace of this issue way down. There’s a certain flow inherent in great artwork, something that sleekly moves your eye from one major point of emphasis to the next, and it’s missing in Requiem. I suppose it’s a fitting tribute to this series that its final bellow is such an accurate representation of the sins that led to its demise. Flashy artwork that’s pretty but fundamentally lacking, vague writing with plot holes the size of Magneto’s floating island... yep, this serves as a pretty good outline of what went wrong. Ultimate X-Men began with such vigor and life, it’s hard to imagine this is where it would ultimately (no pun intended) wind up, but here we are. This is inessential to the core, something that wants to have depth and substance in the worst way but doesn’t really know how to get it done. Flip through it and then walk away.